This is the third post in our Life Science Marketing Plan series, where we will describe the second half of the components. In the last post, we described the first half of the components, which are the Executive Summary, Situational Analysis, Sales History and Forecast, and Market Research. While this sounds like a weighty list already, it represents only the first half. Here, we describe the second half of the components, which will round out your plan and give you the perspective you need to define your life science marketing strategy and tactics. Competitive Analysis. This is my favorite part of the marketing plan, finding out what the competition is up to! You likely have some ideas, as you should be following them all year, but this is a good time to take a hard look at them. You likely know who your competitors are, but keep an open mind and ear during your market research, do some internet research to see if any newcomers have emerged, and talk to others in your company, especially those who are customer-facing such as sales or customer service. As with other areas we’ve discussed, this exercise can be simple or elaborate, and the amount of complexity normally scales with the size of your company. 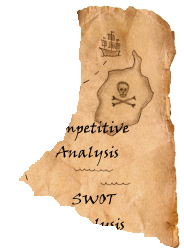 Regardless of the scale, I always include a SWOT (Strengths, Weaknesses, Opportunities, Threats) analysis to put the competition in perspective. Basically, this involves an analysis of the situation from both internal (Strengths and Weaknesses) and external (Opportunities and Threats) perspectives. In addition, it is also useful to make a table which lists each of your competitors in rows, with two columns for each indicating their products’ strengths and weaknesses. The purpose of this table is to determine what advantage your products have compared to your competition, if any. As with the rest of the marketing plan, which we describe as a journey, this part can be a bit of a soul searching exercise, as you may find that your products are poorly positioned. Better to find this out now and to develop an action plan involving focusing more time on product development, rather than miss your competitive edge and miss revenue targets. Strategy. At this point in your ‘journey,’ you’ll have learned a lot about your customers, the competitive landscape, and the challenges you face in reaching your goals. It is here that you need to define your position and messaging, as these items will guide the strategy you will employ. Your position is a description of the unique benefit that your products provide, and the messaging is how you communicate it. For example, your position may be to provide ‘the fastest protein chromatography method for membrane proteins.’ This statement must be based on reality, not just hopes and dreams, as it will be apparent to everyone, most notably the customer, if you are not being honest with yourself. As you know, being market driven means identifying these issues and bringing them to everyone’s attention sooner rather than later, so that products that are positioned well can be developed. In this case, your strategy will involve more time in product development rather than advertising. If your positioning is on target, your messaging will focus on the benefits that your product’s positioning will provide to your customers, and will speak to what you know is important to them, or their ‘pain.’ Because you’ve spent time getting to know your customers in the market research area, you’ll know this. Following the example earlier, your messaging could focus on the benefits of publishing faster. You’ll also want to include a broad overview of your tactical plan in this section, backed by your strategy. For example, if your overall strategy is to reach out to more protein purification researchers through the internet, then your tactical plan will be focused on improving your website and online advertising. Tactical Plan. This is where you outline your advertising activities by date and predicted expense. An excel spreadsheet works well, with months as columns and tactics as rows. Include advertisements, conferences, and note when product launches or other major events will occur. Of course, coinciding product launches with conferences and relevant articles in editorial calendars will help you to maximize your resources, as is a marketing mix which will expose customers to your message multiple times in a short period of time. In order to estimate the expenses, you’ll want to start at least a month before contacting media account managers to get their media kits and perhaps hear from them as to what’s new with their publication (see our 2010 planning guide for help). Your tactical plan is very important, as it will determine many of your deadlines throughout the year, so consider it very carefully. A well written marketing plan serves many purposes, from giving you the necessary perspective on your products to communicating your strategy to others in your company. In the last post of this series, we’ll talk more about the big picture for the life science marketing plan, implementing it as well as changes you’ll need to plan for today’s new media. Check out the whole series here and sign up for updates so you don’t miss anything!